When summer comes, there’s no better place to be than relaxing by the pool. But it can sometimes be uncomfortable to lay outside without any protection from the sun. That’s why SRA Home Products is pleased to offer tropical spa cabanas to families in the New Castle County, Delaware, area — our cabanas allow families to relax outside while remaining shaded from the sun’s damaging rays. Plus, with optional privacy curtains, you can even turn your new cabana into a convenient poolside changing area for guests. They’re constructed using heavy-duty, fully extruded aluminum, which offers greater strength than wood, vinyl, and roll-formed aluminum alternatives. They resist rotting, deterioration, and insect infestation. They’re protected by TEMO’s exclusive TEMKOR polymer coating, which guards against fading, chalking, cracking, scratching, peeling, denting, and warping. Plus, like all TEMO products, their cabanas come with a limited lifetime transferable warranty. So, if you decide to sell your home at some point in the future, you’ll be able to offer this warranty to potential buyers as a valuable selling point. 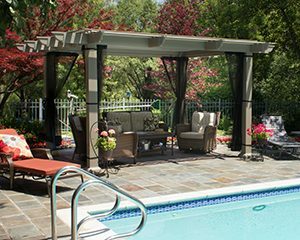 If you’d like to learn more about adding one of our tropical cabanas to your New Castle County, DE, backyard, please contact SRA Home Products today. When you choose our company, you can rest easy knowing that you’re working with true outdoor living experts. Since being founded in 1988, we’ve installed more than 5,500 products, and our installers are factory-trained and certified to ensure the best possible results. We look forward to working with you on your next project.